NAIROBI, Feb 20 2012 (IPS) - Jesse Mtembe, a nursing officer at the Akithenesit Health Centre in Teso North, in Kenya’s Western Province, cannot wait for his centre to be connected to a new software system for diagnosing HIV in infants that is being developed in the country’s leading private university. Soon Mtembe’s patients will be able to receive the HIV tests results of their infants as soon as the relevant blood tests have been conducted at one of the country’s central laboratories some 200 kilometres away. Currently parents in rural health centres wait up to 18 weeks for the blood test results. Since 2011, students at Kenya’s Strathmore University have been developing and refining software of infant HIV diagnosis. The software has been implemented in 75 health centres in the remotest parts of the country as part of first phase trials. The software seems simple enough. Once blood samples arrive at one of the country’s four central Kenya Medical Research Institute (KEMRI) Centre for Disease Control and Prevention (CDC) laboratories all samples are logged into the system. Once this is done, the software automatically generates a short message service (SMS) to the rural health centre the sample was sent from to confirm receipt. Once diagnosis has been completed, the system generates another SMS to confirm this, and if the result is negative, the results are also given. Results are received in rural areas on SMS printers and parents are notified by the clinic that their results are ready. “On the SMS printers that we have already installed in rural clinics, we only send negative results in real time. This is because as a policy, all positive results on the polymerase chain reaction (PCR) equipment have to be re-run for confirmation in order to avoid false positives that might be due to contamination,” said Oscar Mulondanome a lab technologist at the Alupe Centre, one of the country’s testing laboratories. Unlike other HIV testing methods such as rapid tests, where a patient receives the results after a few minutes, testing for the virus in infants requires the PCR technique, which is used to amplify the genetic make-up (or DNA) of a single or a few HIV viruses. 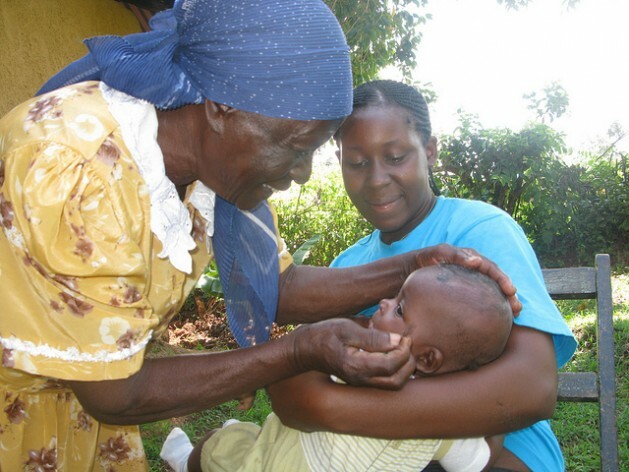 In Kenya, early diagnosis in infants is conducted with the support of the National Aids and STIs Control Programme and the United States Army Medical Research Unit. The project is being funded by the Clinton Health Access Initiative. “The database application has allowed real time analysis of data generated for active interventions and has a wide geographical coverage,” Silvia Kadima, a research scientist at the KEMRI HIV laboratory, told IPS. “We are projecting that by April this year, the software tool will be customised to Kenya’s local needs, and that is when it will be officially launched and rolled out by the government,” said Kadima. She said that 50 more facilities would be connected for further trial phases before the product is officially rolled later this year. Kenya has a total of 904 listed public health centres all over the country. The system is a welcome relief to far-flung places like the Akithenesit Health Centre. “Given the location of our health centre in a remote area, we have to rely on lifts offered by officers from the nearby military camp to transport the samples to (the Alupe Hopsital in Busia) some 200 kilometres away, where there is an infant HIV testing centre,” Mtembe said. It is a journey that takes a minimum of 10 hours because of the poor state of the road. “After a few months, we then go through the same route to collect the results. And if they are not ready, then we have to organise another trip on another day,” said Mtembe, who is also head of the centre, which only has three nurses. However, in Kitui County in Eastern Province, residents say they are already experiencing the impact of the system. “For my first two babies, I received their HIV test results 18 weeks after the blood sample had been collected, and this was given during the routine postnatal clinic visits. But for my third born, I received an SMS on my phone five days after the sample collection, asking me to collect the results,” said Elizabeth Mwende a resident of Mutomo village in Kitui. The 17-week difference in receiving an infant’s HIV results is key to effective treatment. “Diagnosis of infants within six weeks of birth allows timely initiation of anti-retroviral therapy (ART) of children below two-years-old and can save lives. Without ART, up to 50 percent of children who acquired the virus from their mothers, would usually die before the age of two,” said Dr. Lucy Matu of the Elizabeth Glaser Pediatric AIDS Foundation. “Early infant diagnosis allows for early and timely intervention. If a kid from an HIV-positive mother turns out to be negative, then proper preventive measures will be put in place to ensure that they do not acquire the virus at all,” added the Prevention of Mother-to-Child Transmission adviser at the foundation.